The original French dish is mainly eggplants and tomatoes with local herbs. 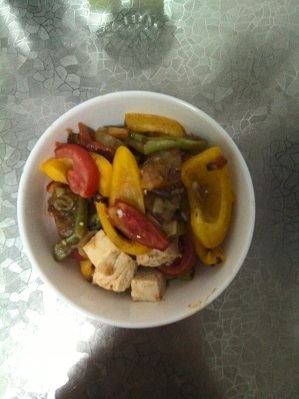 The yellow pepper looks pretty with the tomatoes so I added it, and I replaced the eggplant with smoked, firm tofu. My only local herb is mint, which won't work, so I made a gravy from 5 spice powder and cornstarch. 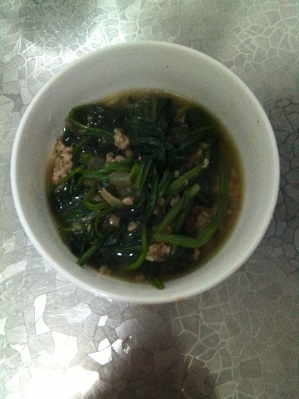 This starts with ginger, garlic, onion sauteed in meat fat or oil, then cook the ground meat, then add spinach in a little water and while simmering, stir a little soysauce with a heaping spoon of cornstarch until smooth, add some water, add these to the simmering food [whose water supply is depleted] and stir until the gravy changes colour to deep brown. 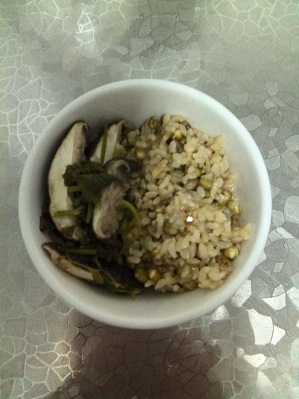 In a two layer rice cooker, cook rice and beans below while on top steaming thick slices of mushrooms with herbs. The mushroom fragrance goes all through the rice. • what will happen when Apple introduces Apple TV with Siri? • Air quality in Beijing: isn't it clear enough? Thanks for your sharing! As I know French friends usually serve food including fruits and vegetables with original taste through simple cooking process. In daily life I always like to mixture kinds of food together and cook them in a pot in which there is enough nutrition for health that is enough for kitchen job! Childish pure mindset can simplify your life which let you live in a light way！ Without man-made troubles you will work in high efficiency!